In this article, you will know how to check waec result without examination number in Nigeria, Ghana, Sierra Lone, Gambia and Liberia, if its possible at all. In a like manner, it will also talk about free WAEC Scratch Card number, how to check waec result using phone, and WAEC Result 2017/18 Checker. 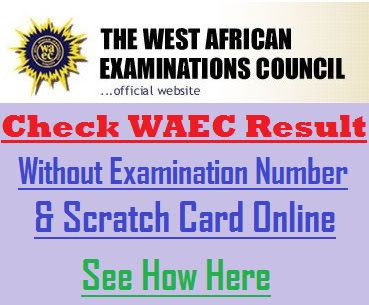 Few weeks ago, we wrote an article about How to Check WAEC Result without Scratch Card without having to buy waec scratch card online at the official WAEC DIRECT website available at www.waecdirect.org/display result. In that article we explain the possibilities of checking WAEC result without scratch card. Read it to find out more. Check WAEC Result Without Examination Number - How possible do you think you can check your result without having an examination number and center number? It like thinking you can drive a non-hybrid car without fuel. When you registered for WAEC examination, you were allocated a specific examination number which is totally different from every other student so that you can be identified with the number. Additional, the center number can be the same for only one exam center/school. Moreover, this is why you always advised to write your exam number and center number in your answer sheet/booklet and not your names. Similarly, after the exam is completed and marked, your score is given to that your exam number so that you can use that number to check your result online when it is released. Likewise, if your exam result is withheld, you cannot also use the number to see your result. I wonder why people are looking for free WAEC scratch card number when they know that nothing is free in this country. The West African Examination Council will never give free scratch card because they are generating revenue from it to solve several "unknown" issues with the organization and in the country as far as education is concerned. BREAKING NEWS: Don't buy Scratch Card for WAEC Nigeria Result Checker - Use Free CIVAMPENS Card Instead - See How!!! So if you are among those searching for free scratch card number which you will use to check your WAEC result online, you may be wasting your time. However, to solve this problem, obtain your scratch card in the nearest center near you or visit the WAECDIRECT office nationwide. With the increasing technology and mobile phones in general in Nigeria, Ghana, Sierra Lone, Gambia and Liberia it has been made possible to check your WAEC result using an internet enabled phone and a non-internet telephones using SMS. As a matter of fact, I have given a detailed explanation in my previous article. You can read How to Check WAEC result on Phones Here. Is WAEC Result out online for May/June Exam session? Yes, it is out. Check it using the link above. Many other students are still searching for methods and steps to enable them check their WAEC result without imputing the WAEC scratch card pin into the WAEC portal. You lie. You must buy WAEC scratch card which is the approved method of checking your result online. Anyways, you can only Check your WAEC Result without Scratch Card with explanations is the link. Related searches are also found below. In conclusion, you cannot check your WAEC Result Without Examination Number & Scratch Card Online because the exam number identifies you as a student while the scratch card gives you access to the WAEC result database through the online portal. A new Guide to Check WAEC Result without Scratch Card will also be included. In our next article, we will focus on how to get NECO and WAEC Result for free and how to check WAEC GCE Result without scratch card pin and serial number, that is if its possible.